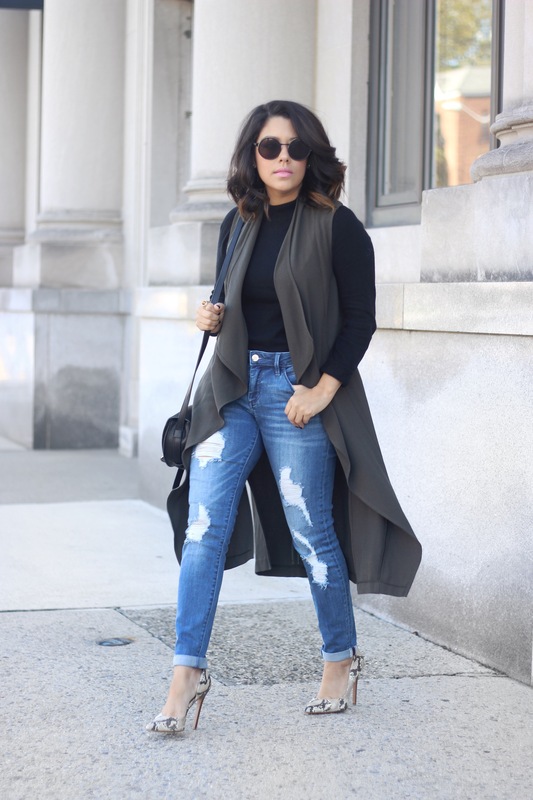 Finally back with a new style post! I have to admit that I’ve been lacking inspiration lately and because of that I haven’t really shot any new looks. I’ve learned that when I am not feeling it to let it be instead of forcing it. We recently got a nice touch of fall weather though and I felt a little bit of inspo to create a light layered look with some of my older pieces. I’m all about pieces that can be transitioned into different seasons, like this trench vest that I got back in the summer. You may or may not remember it, but this is the 3rd or 4th time that I’ve styled it. I love that I was able to create completely different looks every time. As I always say, versatility is key! 🙂 The best part about a vest like this one is that it works well with so many other pieces. I have a few others that are similar and I’ve worn them with anything from denim and white pants to shorts and dresses. Styling possibilities are basically endless. They’ve pretty much become a new staple in my wardrobe. distressed pair is one that I recently added to my ever growing collection. Ripped jeans will forever be a go-to and favorite of mine. I just love their edgy appeal and the fact that they seriously work so well with everything. It’s funny because some people think that having rips in your denim means your outfit looks sloppy, but it’s really all about how you style them. These have a lower rise than I typically wear, so I ended up tucking my sweater into them for more of a chic and polished look. Adding in the snakeskin heels was a fun way to tie everything together, but to also break up the solid neutrals. You look absolutely gorgeous, as always, Naty! I love your hair (that first pic is fabulous, girl!) 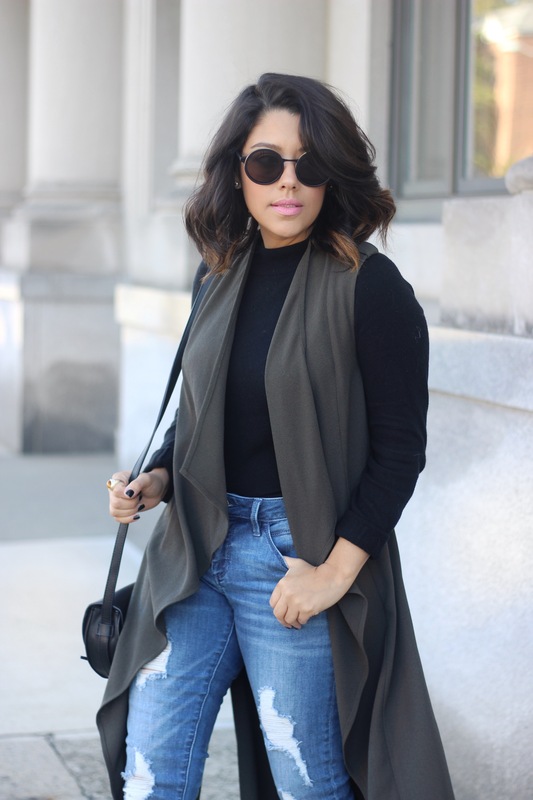 and the whole look is just perfect for fall. I love the pop of print with those BEAUTIFUL snakeskin heels! I love vests, too, I tend to gravitate towards faux fur styles the most, especially in unexpected colors! As for distressed jeans, I only have a few and the ones I do have, have very fiew distressed details; I want a pair like yours, the placement is perfect! Thanks so much for sharing, gorgeous, and I hope you have the most amazing weekend ahead!